News of commercial and domestic fishing in the waters of the Tristan da Cunha archipelago during the 2012-2013 fishing season. for the new fishing boat. for all who took part. as islanders go out to catch fish for the table. perhaps a bit worried about what's for tea? 2012/2013 season ended up being a bit disappointing overall from an Island perspective. We landed a total of 122, 258 kg with the island boats and the Edinburgh caught the balance of approximately 48 tonnes. 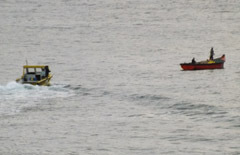 The weather played a very big part in the low island catch as we only managed 39 fishing days between July and April. In order to try and maximise the landings in the early part of the season we will be putting the new boat (Island Pride) into action at the start of the new season, instead of keeping her as a spare boat in case of mechanical breakdowns as originally planned. 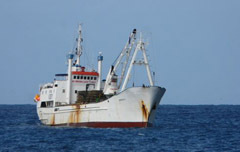 We have also placed an order for an additional two boats to be built in South Africa and they will also join the fishery as soon as they are delivered to the Island.We hope to have these delivered by August, but this will depend on build time and space being available on the vessel going down to the island. The season is planned to start from 1 July as usual, but actual fishing start will depend again on the weather. The boats have been inspected by Government representatives and been given their seaworthy certificates, ready for the new season. From a production perspective we had a good season with a satisfactory final percentage of catch being processed into Raw, Cooked and Sashimi product which is what the market requires. We also packed the required quantities of tails necessary to supply the USA market. We look forward to trying to land the entire quota using only Island boats and crews this season and will pack lobster heads again in an attempt to maximise the use of edible product which was previously crushed and returned to the sea. The situation at Tristan is that there are still 27.6 tonnes of the island’s quota to be caught. MV Edinburgh has already landed 25 tonnes for us and might need to land a little more on her trip here at the end of March. The main problem this year has been bad weather. Average landings over the 36 days fished so far has been 3.25 tonnes which is lower than we expected. November was the really bad month for us as we usually have quite a few fishing days and landings are normally very good at that time of year so we were playing catch up from then on. Fortunately the bad fishing performance coincided with a very welcome increase in the percentage of fish that was suitable for live holding and consequent whole production. The lower than expected daily averages and use of a new live holding vessel at sea meant that fish were both more lively on arrival and could be sorted and graded in less of a rush. The economic return on lobster packed into whole form - as raw, cooked or Sashimi is generally much better than tails and we are happy with the test results so far. It is a fairly low-tech method which is delivering good results - the idea being to keep the lobster fully submerged in natural conditions until they are transported back to the factory and then put back into water as soon as possible. Because we are using small fishing boats it is not practical to have live holding tanks on board so we built a small rubber pontoon boat in which we slung netting to contain the containers of live lobster as they are caught. The next step would be to design a vessel that can actually be towed back to harbour without the need to remove the lobster for the trip back. We hope to publish photos of the fishing operation soon. MV Edinburgh returned from Gough Island on Sunday 10th February 2013. Fishing quotas around Gough and Nightingale Islands are now complete and the ship continued to Inaccessible to catch the remaining 2.5 tonnes of the local quota. MV Edinburgh will then return to Tristan and fish around the main island as there are still 45 tonnes of the annual quota to catch as island fishing days have been limited by poor weather in the 2012/13 season. November ended with day 22 of the season and a total of only 74 tonnes. This compares with a total of 114 tons last year and it is very worrying that we are 40 tonnes behind at this time of year. We had no days in December last year meaning we had potentially until 21 Dec to catch up a little bit, but with one day so far in December delivering 4.3 tonnes and the rest of the days mostly blown out or spent back-loading our product to the Edinburgh or unloading the Baltic, we have a big hill to climb in 2013. We only landed about 35 tonnes from January to April 2012 before having to call in the Edinburgh and with 95 tonnes to go by end of November this year we are looking at the same scenario again. Changes like this not only affect the fishermen, processors and factory staff in terms of lost income, but affect sailing schedules and shipping deployment drastically as well. With Islanders and visitors alike planning their trips long in advance, unplanned variations are seldom beneficial to anyone. One of the few good things to emerge this season is that live recovery has been better than forecast in percentage terms and whole versus tailed production is therefore higher so far. Reasons for this include a drop in daily average landings of app 1100 kg a day and good handling by fishermen and processors. The trials of our experimental floating platform to keep lobsters at sea fully submerged from sorting to landing have also consistently shown good results and once we finalise the best final design we should be able to take this further by placing orders for further units. This might be a slower than expected rollout but it would be unwise to purchase more until we have solved the design problem, so we could end up still experimenting by the end of this season. We might all be pleasantly surprised early next year by big, regular landings of hungry lobster and I certainly hope this is the case. It is quite possible that we end up having a late season as we had signs of lobster carrying eggs much later in the season than we normally expect and daily landings did not increase drastically towards the end of October as we usually expect when the females come back on the bite. This is the only optimistic sign I can see in what is so far a very disappointing season overall. Erik is due to return on the January 2013 Edinburgh trip. A workshop was recently held in Cape Town to assess the latest test fishing data from Nightingale and the lobster juvenile surveys at Nightingale and Inaccessible. 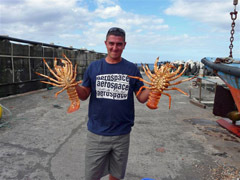 The latest test fishing suggests that although there might have been some mortality of adult lobsters, this was not as extensive as previously thought. It is difficult to assess why previous catch rates were so poor but possibilities are that the lobsters migrated away from the fishing grounds or simply stopped feeding. To assess this further it was agreed to fish commercially for a week to see if catch rates could be maintained. This was carried out and we are pleased to report that the rates were positive. For the 2012/13 season it was agreed that an upper limit of 40 tonnes (which includes the test fishing since July as well as the commercial fishing) be allocated to Nightingale. Everyone agreed that the fish catch was free from contamination and taint. The worry at Inaccessible has always been that the juveniles were affected but it maybe some years before any evidence of this is seen. It was agreed that we should deal with this issue if and when it arises rather than try and predict the outcomes and react accordingly. The workshop also discussed the ongoing problem (not Oliva related) of discards at Inaccessible and agreed to reduce the minimum size to 66mm. 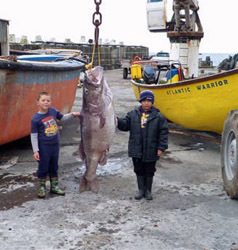 The workshop agreed to increase the TAC (Total Annual Catch) at Inaccessible to 70 tonnes for the 2012/13 season. There are still many uncertainties but things do look more positive than 12 months ago. That said, Tristan will continue to adopt a precautionary approach to the management of the fishery. We have installed 2 new refrigerated cabinets in our on-going efforts to keep tight control over the cold chain and produce a world class product. 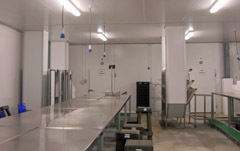 What it means is that wrapped lobster are graded via chutes into a cabinet where cold air is continuously circulating at between 0 and 2 deg C. Once a container of 10 kg is filled it is then removed and placed into cardboard trays and put in the second cabinet onto a shelf within an open trolley, once again at between 0 to 2 deg C. As soon as the trolley is full it is removed and wheeled into one of the blast freezers about 5m away. What this means is that we are able to control the temperature of the product much better than before throughout the production process, start the blast freezing process with the temperature already quite low and eliminate the chance of temperature rises during production. 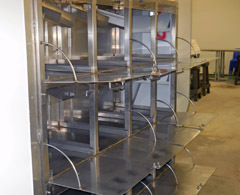 The new system will benefit all our current production of Whole Raw Frozen, Cooked and Sashimi. 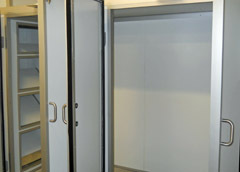 Tails will also benefit as the trolleys will be loaded while being chilled in the second cabinet and will enter the blast freezer at a lower temperature. As far as fishing goes, it has been the best start to the season for quite a few years. 1 Day in July and Day 7 in August means that 25.8 tonnes has been landed so far. Due to the cold water and good on-board handling of the lobster we have been able to pack well over 50% of the landings into either whole raw or cooked product. The sizes being landed are good and generally I think everyone is happy to see an active start to the season. We will most likely be blown out for most of this week so will have to see what the rest of September brings. Erik also reports that his daughter Caitlin(who arrived with him on the August Edinburgh trip) is settling in really well and enjoying meeting new friends and all the freedom the kids have here. She was lucky enough to arrive as the school was closing for 2 weeks , but spends week days with the other kids at the crèche and falls asleep early at night - normally the sign of a day well enjoyed. 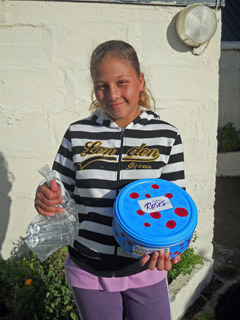 See pictures of Caitlin and her new friends on the Community News Page. The Ovenstone fishing vessel arrived from Cape Town on Thursday 30th August to herald the beginning of outer-island fishing for the 2012/13 season. Tristan island based power boats started the season in July but the arrival of MV Edinburgh for an extended trip means the spring fishing season is properly underway. The vessel will proceed to fish around Gough and Inaccessible and is scheduled to return to Cape Town from Tristan on 16th October. looking for evidence of illegal fishing in Tristan’s EEZ. The ship left Cape Town on 30th July and visited Tristan on 3rd August. after they have been completed, so as not to alert poachers! 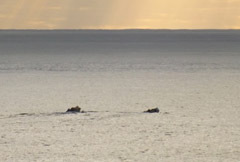 Three atmospheric photographs of boats engaged in the first day of Tristan da Cunha's 2012/13 fishing season on 30th July 2012. The season officially starts on 1st July in mid-winter and Tristan Islanders, based at the on-shore factory, fish Tristan's waters. 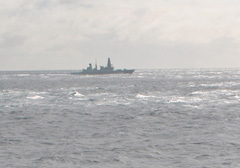 MV Edinburgh fishes the outer islands of Gough, Inaccessible and Nightingale. Writing for the August 2012 Tristan Newsletter in early July, Administrator Sean Burns confirmed that Nightingale is likely to remain closed for fishing for the next few months and the quota for Inaccessible for 2012/13 is still being considered. There will be a drop and therefore lost revenue to the Island again this season arising from the MS Oliva wreck on Nightingale in March 2011. MV Edinburgh is scheduled to leave Cape Town on 22nd August and arrive at Tristan on 29th August, then beginning fishing around the outer islands until returning in mid-October.